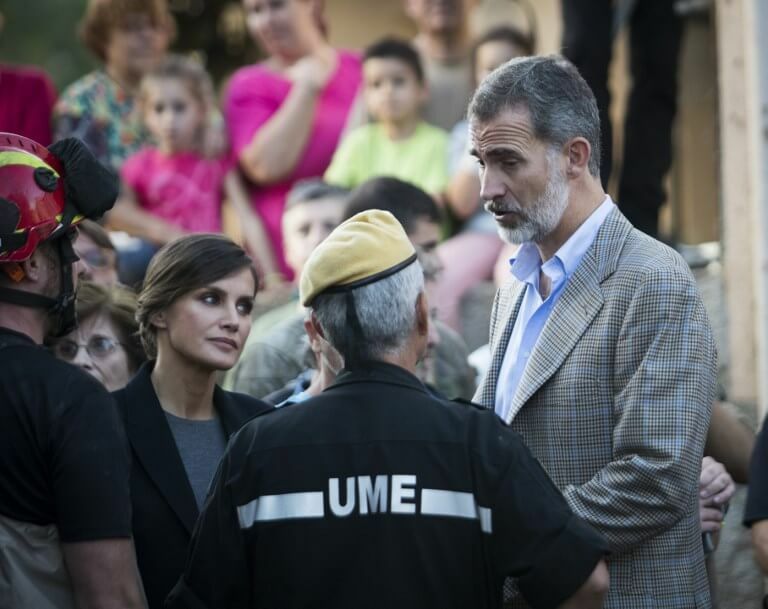 Spain’s King Felipe VI and Queen Letizia visited a flood-ravaged area of the holiday island of Mallorca on Friday, offering encouragement to locals who lost homes and loved ones in the disaster. The royal couple visited several homes that were damaged in Sant Llorenc des Cardassar, one of the towns worst-hit towns by the intense, driving rain on Tuesday afternoon which surprised locals who only had a precious few seconds to react before a torrent of water descended, flooding homes and washing away cars. The king and queen, who was dressed in mourning black, shook hands with locals and volunteers who have come to the town from across the island to help with the clean-up operation. Felipe at one point put his hands on the shoulders of two young girls and posed for a picture with them. Speaking to reporters at the end of his visit, the king said he felt ‘enormous pride over the solidarity everyone has shown here’. ‘All of Spain has been following closely what happened here,’ he added. The royal couple travelled to the island after presiding over a rain-soaked military parade in Madrid marking Spain’s national day. An elderly British couple, their Spanish taxi driver and a holidaying German journalist on his way to the airport were among the 12 people who died as the intense rain caused riverbeds to overflow with raging waters that tore through streets and swept cars away. Hundreds of rescue workers, including divers, and volunteers were on Friday still searching for a missing five-year-old boy who had been in a car with his mother and sister when they were hit by a barrage of water. His sister survived, reportedly helped to safety by their mother, who died. ‘He is the only missing person who we are aware of at the moment. It’s obviously a situation that causes anguish which we want to resolve as soon as possible for the family, for everyone,’ the public administration minister in the regional government of the Balearic Islands, Catalina Cladera, told reporters. The local government of Mallorca on Thursday approved 23m euros in emergency aid to fix damaged roads and other infrastructure on the island. Spanish Prime Minister Pedro Sánchez visited the disaster zone on Wednesday and described the situation as ‘absolutely extraordinary’. Last year, 13.8 million foreign tourists visited the Balearic Islands, according to official statistics. The biggest numbers came from Germany and Britain.